So what caused this? My teammate Andy with the tow rope is the one I blame. You’ll understand why as we get into the story. Almaden Quicksilver is a relatively small park just South of San Jose. You look at it on the map and you would think there couldn’t be much adventure there because its so small. You’d be wrong. 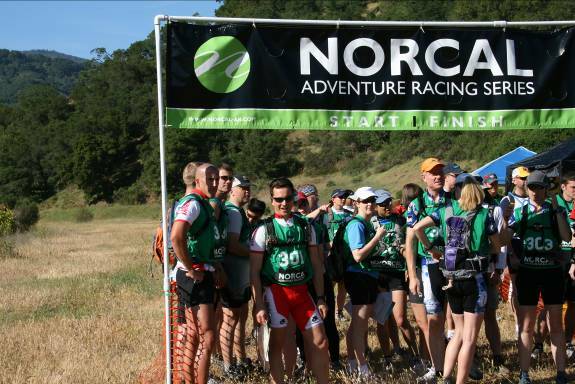 The second race I ever did was at Almaden Quicksilver and we ran out of water about 2 hours from the TA. There was absolutely none on the course. Another thing about this park is that there are no flat trails. You’re either going all the way up the mountain or all the way down and even those trails manage to go up and down on their way. This race started at the South end of the park and the only way out of that area is to go straight up. Rich Brazeau gave a quick per race meeting and told us that there would be a staggered start with solo’s and 4 person teams going off first and the rest following in 5 minute intervals. We had 1 minute to copy the course from a master map onto our own copy of the park map before heading out on the course. After a couple of quick team photographs in our new race clothing to pass onto Brunton, Ritchey and INOV-8 we lined up on the start line. The pressure was on for the navigators as they had to plot the first 5 points in 1 minute and make sure they were correct before starting the run. I had Mari looking over my shoulder to make sure I plotted correctly which was perfect. I took a quick look at the possible routes and decided to take the CP’s in number order, which would have us finishing with a long downhill from the top of the mountain and let us warm up a little on the more undulating climb out to CP 1. You could get the CP’s in any order and the teams in the wave ahead of us were running off in all different directions depending on their choice of route. We immediately started out a good run pace and I hadn’t even got across the parking lot before Andy hung out the tow rope for me, and he didn’t slow at all when he hit the climb with me attached. I could tell this was going to be a fast day as I could hear Mari breathing which is very unusual. I’ve not heard that since we did Ocean Blue last year and she had a broken rib before we even started. She could only take little short breaths on that occasion but was still keeping up with us. Before we got to CP 1 we passed a couple of teams. We were caught out by a dead end portion of fire road and had to back tack about 100 yards. This is typical of racing at Quicksilver as there are numerous pieces of road that are not marked on the map and if you’re using a USGS map, there are roads on the map that no longer exist in the park. We found CP 1 along with two other teams and quickly opened a gap on them as we climbed on our way to CP 2. CP 2 was in a stream gully and we caught another team just before we got there. We had given Mari the CP passport at the start so she was the one that braved the poison oak to get the CP punch. My feet were on fire when we arrived at CP 2 and I realized that it was because Andy had been towing me downhill at high speed. It was all I could do to stop being dragged over onto my face. I’d been trying to slow myself down with my heels and without much success as Andy weighs a good few pounds more than me and has much longer legs. I could already feel the blister forming on my left heel.. It was like trying to slow a freight train.. The rest of my feet were really comfortable in the INOV-8 shoes but I was suffering from the unnatural act of trying to slow a fast charging teammate on a steep downhill. I was surprised things weren’t worse. Now we had a rolling section of trail to CP3 and then the long climb to the top of the park to get CP4. We were feeling good and so far the navigation was going well. We had decided to stick to the trails as none of us wanted to go anywhere near the Poison Oak that was abundant in this park. From CP 3 to CP 4 the navigation was a little tricky but we were going a little slower uphill now. The trails were like a maze up there and very confusing. There was a moment of indecision at one trail junction but we quickly recovered. We found CP 4 and then started the run down the mountain to the bike transition. The run downhill was a little painful as the blister on my heel had grown pretty large. Luckily I normally run on the balls of my feet and was able to avoid making things worse when I wasnt being towed. As we came into the TA I could see that Kent was already there looking at the map for the next set of CP’s. He had started in the wave ahead of us and we hadn’t caught him but we hadn’t lost any time to him either. I immediately started plotting the next 9 CP’s onto our map as Mari and Andy changed into their bike gear. When I finished plotting I was rushed to the car where my teammates took care of changing my shoes, repacking my gear and feeding me for the next section. We were told we would need our running shoes during the bike section after CP 10. We started riding up the mountain and everyone was looking good. There were 4 out and back sections before we reached the transition at CP 10. This would give us a good idea how far ahead of us Kent was as it would be easy to time the gap. CP 6 was our first bike CP and we would follow that with CP 8 at Hildgo Cemetery. About half way out to the Cemetery we spotted Kent coming back up the trail. Andy timed us back to that spot and we were about 6 minutes behind him. We were gaining a little from the 8 minute lead he had when he left the transition. The next CP would be a good indication as it was a long rolling out and back to Hicks Wood Road entrance. We reached the CP and were surprised that we hadn’t seen Kent on the way. There was no other way to get to this CP other than out and back on the same road. How could we have missed him? There were no other trails and the terrain across country didn’t suite a shortcut. Something was wrong. We kept going and tried to speculate where he had gone. Kent doesn’t make navigation errors so he must have found some secret route that we hadn’t seen. The trail from the fire road to CP 9 was messy with various dead end offshoots that made it a little confusing but we found it without too much trouble. Still no sign of Kent on this trail either. We now had a short ride to CP 10 and the transition back to running. We arrived at CP 10 and found Galen and Jen of BAARBD.org manning the CP to keep our bikes safe during the run. Kent’s bike was there already so we asked if he had got CP 7. They told us that he had missed it and made an uncharacteristic mistake. Somehow he had forgotten to get it. This meant that he would take a 1 hour penalty and we were now leading. Andy immediately told us that this was an adventure race and anything could happen before the finish so there would be no slowing down. I was back in my running shoes and back on the tow rope for the next 3 CP’s and 6 or so miles. This section of the course ran along the reservoir and a stream. We didn’t refill as we had plenty of water in our packs and full bottles back on the bikes. This run was more painful than the first. I was having trouble catching my breath at Andy’s pace and I was hurting from the effort. We slowed to a walk on the steeper hills but ran all the flats and down hills. I almost made the same fatal error as Kent at CP 12 by thinking I was done with the trek CP’s. I was getting a little light headed from the pace and needed to eat and almost turned the team around forgetting about CP 13. Lucky enough Mari checked the Passport and spotted that we still needed to get one more in the other direction. Its amazing how much you zone out when you’re being towed and can forget where you are. By the time we got back to the bikes I was in a bad way and needed some food. Andy got me to eat as we started on the home leg to get the final 3 CP’s. Galen and Jen had told us that Kent had cut across country on the trek section and had made up 30 minutes of on us in about 6 miles. He was on a mission to make up for the penalty and Kent could do it if anyone could. I reset the bike computer and started to measure the distance to CP 15 which was shown as being on a bend in the fire road between two trail junctions. When we arrived at the spot where the CP was supposed to be we couldn’t see anything. I looked at the map and thought that I hadnt gone far enough so we carried on a little further. All the trail junctions said that that the CP was behind us so I reset the bike computer and we turned around. We got to the right spot on the trail but the marker was missing. I was very concerned that I must have marked the CP in the wrong place when copying it from the master map. This was an easy mistake to make in the heat of a race. We spent about 30 minutes looking around and trying nearby trails but couldn’t see the CP marker anywhere. If I had marked it on the map incorrectly and we didn’t find it then we would have the same 1 hour penalty as Kent and we would have lost our lead with the time we spent searching. We decided to abandon the search and focus on the final 2 CP’s. These were two CP’s that we’d visited earlier in the day. One was at the bottom of the mountain and the other was in the opposite direction at the top. As we started the steep downhill to CP 2 I knew that it was going to be a very painful climb back out. I had ran out of water and was scrounging off Andy. We reached the CP and started climbing back up the way we came. Mari dropped the pair of us and reached the top well in front of Andy and I. As we got close to the top of the climb we saw Kent flying down the hill towards us. I wanted to stop him and see where he had plotted CP 15 but he was going way too fast. I shouted to him “did you get CP 15??! !” He replied with a very clear “Yes!”. My spirits dropped, I must have miss plotted it from the master map. Andy rode up to me and confirmed that Kent said he got CP 15. This was turning really bad for us. We’d missed a CP and were out of water with a climb back to the top of the mountain still to do. As we caught up with Mari we gave her the bad news. It looked like we would get a 1 hour penalty for missing CP 15, we were now racing for second place and possibly 3rd. We only had 1 more CP to get and it was at the top of the mountain. It was time for me to pay Andy back as he had run out of water and as really suffering on the bike. I hooked him up to the bike tow and started pulling him up to the top of the park. We were all out of water at this point and really suffering. I was thinking how lucky the team was to be supported by Ritchey and supplied with the lightest wheels and carbon components. I’d hate to be towing Andy and two heavy bikes up this bloody hill. As we neared the top of the hill we ran into some hikers who needed directions back to the parking lot and their car. I showed them the map and gave them the shortest route back. In exchange they gave us a full bottle of water that I shared it with the others. It could have been muddy puddle water for all I cared but it tasted really good and was just what we needed. Once we got the final CP it was a high speed descent to the finish and the bad news on the missed CP. When we arrived at the finish line there were 2 already teams there. Kent and Racing with Giants. We gave in our passport and I stared asking Kent about CP 15. Where was it on the map and where did he find it? He tells me that CP 15 was misplaced on the course and he hadn’t found it. Who knows what he thought I said the last time we saw him but it couldn’t have been anything to do with CP 15 or he was playing games with us. I then asked John Turner of RWG if he had found CP15 and he said he stumbled on it by accident in the wrong location. But his team were back early as they had been short coursed. So what did all this mean?! Super supporter Hailey was telling us that we had won but neither Andy or I believed her. Even when Rich told us that we had won I assumed that there had been some mistake with the scoring. It turns out that Kent didn’t make up enough time to overcome his 1 hour penalty. And no other team found all the remaining CP’s. As CP 15 was in the wrong place it was eliminated from the results and didn’t count. We had actually won this event despite all the problems out on the course. We finished in 6 hours and 9 minutes. For such a short race we certainly suffered a lot out there. It was very hot and very dry but so much fun. I’m glad we managed to keep going even when things looked so bad that we must have lost the race. Adventure Racing is incredible like that. You never know what’s going to happen next. One minute everything is going fine and you’re on top of the World the next everything looks lost, but then somehow you work together and recover to finish strong. As always Rich and his team put on a fantastic race in a great little park. Never underestimate Amladen Quicksilver, it is a very challenging place with little water and truly brutal terrain. I’m looking forward to the next event in the NORCAL-AR series. 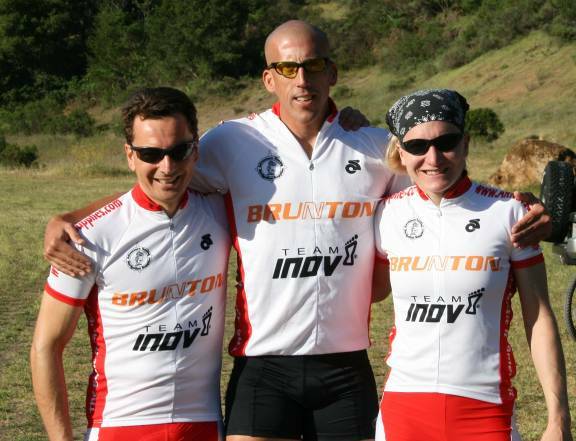 Thanks to Brunton INOV-8 and Ritchey for providing AR Nav Supplies with the best gear.